Lucy is a sweet-spirited white woman, probably in her 50’s, with a bushel of greying hair and a quiet demeanor. If it weren’t for the ragged sweats, bags, and flattened cardboard box she uses to sit on, she could just as easily be your aunt. 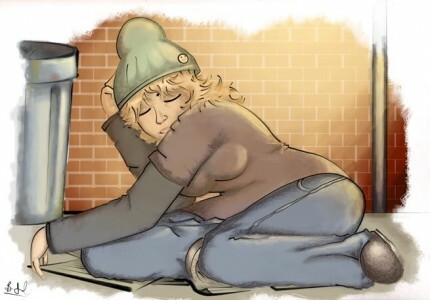 She doesn’t have a permanent home, but that doesn’t make her any less interesting to talk to than any other middle-aged woman in L.A.
She joined us one night on the street, but sat off to the side on her flattened cardboard box. When I went over to say hi and invite her in closer, she explained she was sick and didn’t want to sit too close because of her cough. She offered another box for me to sit on beside her. We talked for several minutes before Bible study, and prayed for her healing. She came back again a few weeks later, laying on the ground to the side of Bible study. We weren’t quite sure if she was listening or asleep, but afterward she had thoughts and questions to share about the message, and we knew she as engaging in her own way. But wondered why she didn’t come closer…. This happened a few other times. Was she still sick? Anti-social? Mentally ill? Nope. If stepping out of church walls and onto the streets teaches you anything, it’s that looks can be deceiving. Lucy told Antquan that she didn’t want to sit too close because she recycles all day, so she’s worried about her smell and didn’t want to bother anyone with her odor. In all honesty, I’ve never sat next to her and thought she smelled. But she works hard all day to sustain herself, and unfortunately, that makes her feel repulsive to social settings. So Antquan began asking everyone that at the end of our Refuge service every week, we keep our water bottles rather than throw them away. Then we give them to Lucy. Just a few weeks into this, she came to White as Snow and stayed for the Refuge again. Before it started while we were setting up, Lucy stood near everyone, talking animatedly, and shared how after that night we prayed for healing, she felt better and even began gaining weight after she’d lost so much weight people she knew began to ask her about her health. That night she not only talked more than ever, but sat right next to the whole group of people.